January 31 (New York) — Educators for Excellence-New York (E4E-New York), a teacher-led organization, celebrated the passage of A1715/S101A, which bans allowing teachers to carry guns in schools. 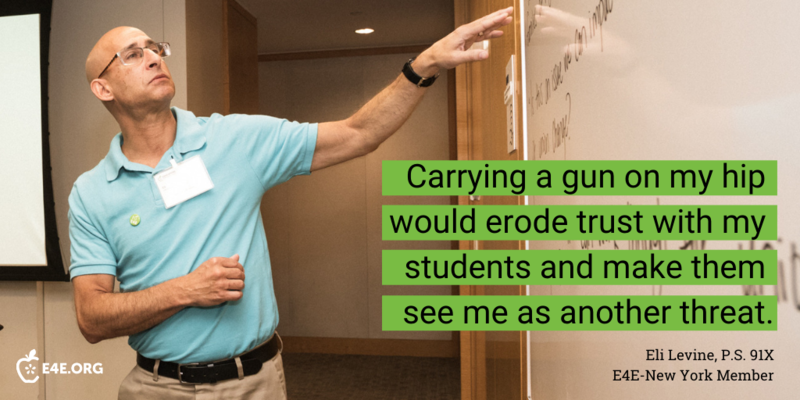 Teachers largely reject proposals to arm classroom teachers, according to the results from a nationally representative survey of teachers across the country and New York City. Thirty-six percent reported that they are most concerned about gun violence/school shootings at their school. Thirty-seven percent report fearing for their own physical safety at least sometimes or often at their school. Sixty percent of New York City teachers oppose this idea of arming classroom educators with 53 percent of respondents “strongly opposing” the idea. To manage discipline and make schools safer, New York City teachers believe positive behavior reinforcement (81 percent) and restorative practices (75 percent) most effective, greatly preferring them to punitive and exclusionary measures, such as out-of-school suspensions (55 percent) and expulsions (54 percent).